Yesterday Ava's school celebrated Drop Everything And Read Day (D.E.A.R Day). To celebrate, students were invited to come to school dressed as a favorite book character. You know we can't miss an opportunity to play dress up so the girls and I were pretty excited about this. When I was a kid in Australia we always celebrated Book Week at school with a dress up day and a parade. Every year I see my friends' kids dressed up for Book Week on Facebook and I feel like my girls are missing out. Of course, we get Halloween which is much bigger, but still I feel a little jealous that we're missing out on the fun. So when the opportunity to dress up for D.E.A.R Day came up I jumped on it. Like a lot of kids her age Ava is kind of obsessed with Minecraft and has been reading a lot Minecraft books lately. I expected her to want to dress as a Minecraft character - which I know absolutely nothing about. I was pleasantly surprised when she told me that she'd like to dress as Charlie Brown. An instantly recognizable character and a super easy costume to make. A yellow t-shirt painted with a black zigzag and voila! I also made a cartoon speech bubble for her to hold and Lola's plush Snoopy tagged along. Lola wanted to join in the fun and was eager to dress up as the title character from Rosie Revere, Engineer by Andrea Beaty. She was given the book last year by a friend who thought that the character looked a lot like Lola. 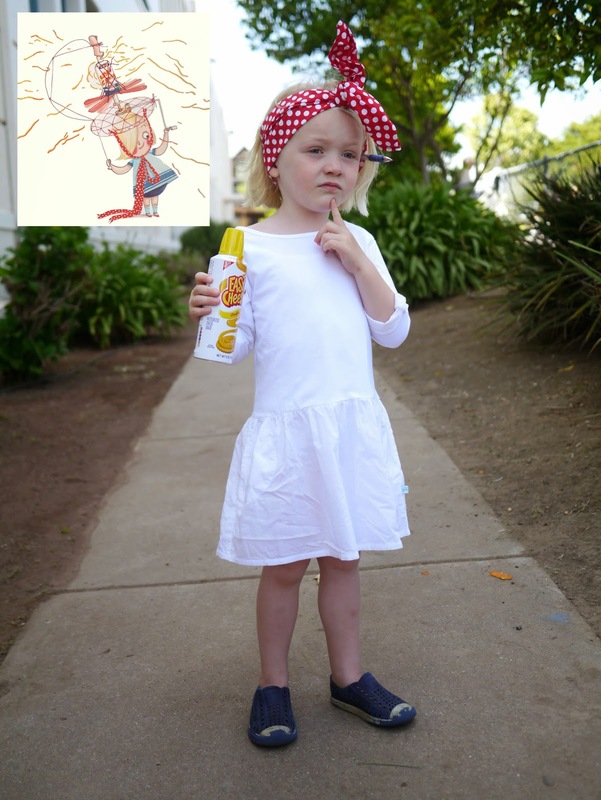 And indeed Rosie Revere does look quite like Lola so the costume was a pretty easy one to come up with - just a white dress, a spotted head scarf, and a pencil behind her ear. Oh, and a can of spray cheese because many of Rosie's inventions involve a car of spray cheese! I attempted to dress Mathilde up as the Pigeon from the Mo Willems books but she wasn't particularly cooperative and kept pulling her hat off. Her costume was pretty last minute anyway as I hadn't originally planned to dress her up. Did your kids have D.E.A.R Day at school yesterday too? Did they dress up as a book character? I'd love to see what other kids wore if they dressed up.